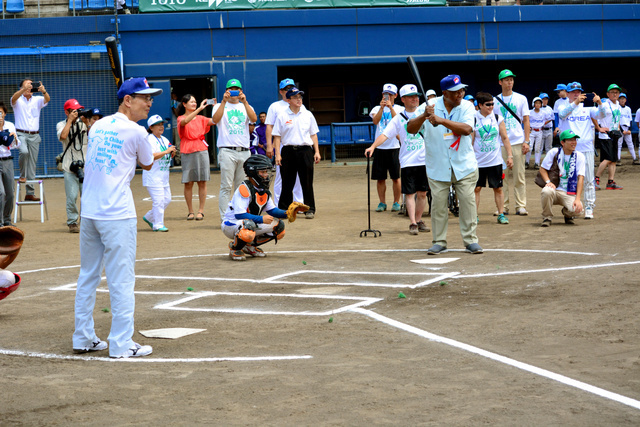 Sadaharu Oh (75), Chairman of the World Children’s Baseball Foundation (WCBF) and former Tokyo Yomiuri Giants great who slugged 868 career home runs, and the co-founder of WCBF, Hank Aron (81) with 755 career homers, initiated the opening ceremony at NaSPA Stadium in Narita, Chiba on August 4, 2015. Oh said to the children to make friends and bring back good memories. The Fair will last for 6 days until Sunday, August 9, for baseball clinics at Nakadai Sports Park and friendly games with 14 teams from Chinese Taipei, Korea and Japan at MaSPA Stadium. Myanmar, the newcomer to the Fair, joined 15 other teams from Canada, China, Chinese Taipei, Denmark, Fiji, Germany, Hong Kong, Korea, Malta, New Zealand, Peru, Philippines, Switzerland, U.S.A. and Japan. The World Baseball Softball Confederation cooperates with the World Children Baseball Fair to help develop baseball among young people in various countries. The aim of this event is to expand the sport throughout the world and help children learn the game by the international coaches and promotes friendship among children. Global development of the sport helps the ongoing drive to reinstate baseball and softball to 2020 Olympics. The ten WBSC nominated coaches are: Angel Bonilla (Head Coach､U.S.A. ), Yoshihisa Uchikawa (Subhead Coach､Japan), Darwin Barker (Canada), Eugene Kingsale (Netherlands), Frank Marcos (U.S.A.) Narelle Gosstray (Australia), Lucio Taschin (Italy), Alessandro Rosa Colombo (Italy), Daishin Nakamura （Japan） and Maki Ito (Japan). They will be assisted by the members of International Budo University’s Baseball Club. The WCBF inaugural event was held in Los Angeles in 1990, and over 5000 participants - boys and girls of 10 and 11 years old - from 93 countries/regions have attended this global event.